LOCATION.--Lat 41`19'50", long 79`12'33", Jefferson County, Hydrologic Unit 05010005, on right bank at downstream side of bridge on State Highway 36 at Cooksburg, 300 ft downstream from Toms Run, and 2.7 mi upstream from Cathers Run. PERIOD OF RECORD.--October 1938 to current year. Monthly discharge only for October, November 1938, published in WSP 1305. GAGE.--Water-stage recorder and heated tipping bucket precipitation gage. Datum of gage is 1,147.00 ft above National Geodetic Vertical Datum of 1929. Prior to May 17, 1939, non-recording gage at same site and datum. Satellite telemetry at station. COOPERATION.--Station established and maintained by the U.S. Geological Survey. 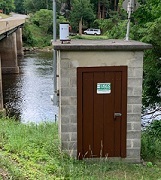 Funding for the operation of this station is provided by Brookfield Power, the Pennsylvania Department of Environmental Protection, and the U.S. Geological Survey. REMARKS.--Flow regulated by East Branch Clarion River Lake since June 1952 and at low flow by industrial plants above station. Supplied by NWS: Action stage-10.5 ft; Flood stage-13 ft; Moderate flood stage-15 ft; Major flood stage-17 ft.